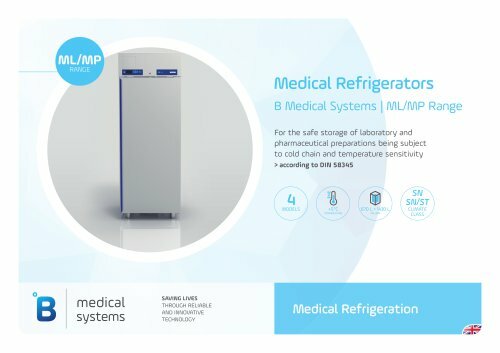 MEDICAL REFRIGERATION ML/MP RANGE | Medical Refrigerators Technical Data General features ML 670 SG Net weight with standard equipment (kg) 152 244 172 285 Heat emission (Kcal/h) Compressor running time (%) Noise level (dB(A)) (at 1m height & 1m distance) B Medical Systems | Medical Refrigeration All values were measured at +25°C ambient temperature and without load (with inertial mass). Subject to change without prior notice. Some of the accessories shown in the pictures are optional.